Ken Feldman was one of the original three people who came up with the God of War concept and worked as a lead environment designer on the first game. David Jaffe and Tim Moss were the other members of that trinity. During the sequel's development, Feldman worked behind the scenes on future technology and is currently the art director of God of War III. 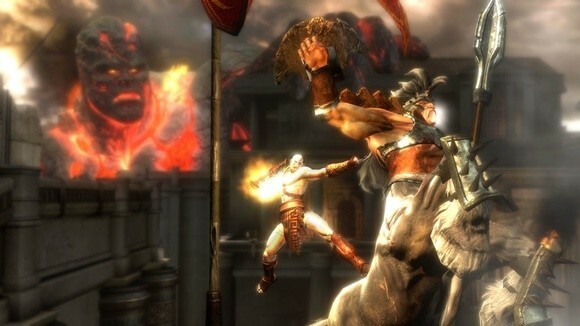 We chatted with Ken at the God of War III preview event in Los Angeles this week, where he detailed the overhauled game engine, Kratos' new PS2-busting polygon count, and inspiration for the God of War style. Did you work on any of the previous titles? Yeah. Actually, Tim Moss, myself, and David Jaffe were the first three people on God of War. We were the three guys that came up with Kratos, the usage of Greek mythology, and all that goodness. When God of War finished, I was lead environment artist on that project with Stig, and so him and I go back quite a ways. When that game finished, Stig went on and art directed God of War II, and I went on and started working on the technology for God of War III. My time on God of War II was very limited. It was just like, "We are behind schedule and we need somebody to help us out." So I have been working on technology and making sure that the art tools and all that we are creating are not just a bucket list that you can sort of check off that all of these so-called "next-gen" games have, but that they kind of fit the universe that we are trying to make with God of War and with what we want to do with the game. So this is actually a really exciting day for me, because this is the first time I have actually gotten to show what we have been doing for the last four years now. It is pretty exciting. As art director, what do you define your duties as? "I like to think that my job is to implement the director's vision." The way that our studio works is that Stig, the director of the game, has final say on everything. At some level, the story comes from him, and the direction comes from him based on a story. I like to think that my job is to implement his vision; to make sure that his vision gets realized in the game. I work with a concept artists -- as does Stig -- the level artists, animators, character artists, special effects artists, et cetera, to make sure that vision comes through. So yeah, that is it. It is a lot of communication. It is very creative. Whereas in the past, I was the one that was down pushing polygons. You take a step back from that and it is like those ideas that you have in your head, now you get to affect the entire team instead of just one level. John Hight, the guy that runs the Sony Santa Monica studio, was telling me that you are using the same engine from God of War II. Is that right? There are some truths in that we are using the same engine, but the renderer is brand new -- we're not using anything that was with the God of War II game rendering system. We are using a brand new renderer, brand new animation system, because the animation system needs to sit on the SPU so that it runs really fast, so we could have four times or 10 times as many joints on character; so we could do things like the Titans. On one of our Titans, we have probably ... I want to say as many joints on all of the characters that we had on God of War II on one character because of that. The core engine is all brand new because it has to be able to manage across all the SPUs. What would be the same would be like our entity code. So the game play code was great, because from the very start we were able to continue designing game play. What we didn't have was the new types of game play that we wanted. I mean, we could still wall climb and all that, but we couldn't walk on Titans. We couldn't ride on the back of characters, so we had to make that kind of stuff. So we had to improve on the engine. I would say that a lot of the engine is new. What do you guys draw from for inspiration for the look of the game? First off, I think that what we learned from the first game is that we have to make sure that it looks Greek and that we can't get too tribal or too fantasy with it. We have to stick in the reality of it being Greek. The other thing I would say is that I really love this universe we have created with Kratos, because it does allow us to ... we are not bound in the reality of having to draw a city or do a shooter that was part of a war. We don't have to just do a game based on warehouses. If we want to have a warehouse in the game, we can have a warehouse in the game. If we want to have a jungle in the game, we can have a jungle in the game. And if we want to have a city, we can do something like Athens. "We have to make sure that it looks Greek -- we can't get too tribal or too fantasy with it." But beyond that, we wanted to kind of start exploring how these things move. For me, it kind of started back on the Hydra Battle, in that I really wanted that thing to be like a rough sea with these ships being tossed around everywhere, and start to think about how environments can be much more dynamic. I think what we started to bring into God of War II, and now what we are fully doing in God of War III, is making levels, environments, and cities; actually the type. It is not a jungle that exists somewhere in the Mediterranean. It is on the back of Gaia. The great thing about Greek Mythology is people can draw from the familiarity. They know who Medusa and Cyclops are. When my wife, who has never seen the game, sees Cyclops appear for the first time, she is like, "That is Cyclops because he has one eye." We all know that. Then from there, it is like, "How can we update that for a modern audience? What kind of an evil twist can we put on that from a looks standpoint, and then what are the actions of that character in the game?" I think, because of that, we are really able to push a lot of style and fantasy. In the first game there was a bonus moment when you see a modern day soldier in the ruins of Pandora's Temple. Do you remember that?